Let me pitch it to you: Matt Burkett is Apollo Z. Hack. Hack is not just a web based movie reviewer, for he is destined to be the either the savior of the Reviewaverse, or the destroyer. He periodically releases reviews of movies that he feels are under appreciated, but his biggest claim to internet fame is The Reviewaverse Saga - a seven part epic about the resurgence of an ancient Nerd civilization, a coming Nerdpocalypse, and references to Battlestar Galactica and the Kamen Rider series. 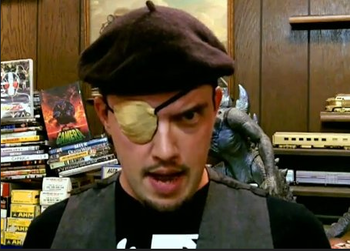 The Reviewaverse itself is home to all internet reviewers, including the people at That Guy with the Glasses, Spoony, the Angry Video Game Nerd, etc. And in Burkett's hands, the act of reviewing becomes something epic and meaningful. Reviews with an overarching plot isn't new - Linkara did it before - but The Reviewaverse Saga is perhaps the first to focus more on the plot than the actual review. An episode of the saga will start off explaining the plot, then a character would mention a movie offhand, a review ensues, then the plot continues. Aborted Arc: Burkett announced that he probably won't finish the Reviewerverse Saga, though he did conclude it (sorta) with episode 6, which was already in production at the time. An authorized rough draft of the seventh episode (as written and pitched by Burkett's fellow reviewer the Trenchcoat Anti-Critic, who guest-starred in episode 6) can be found here . The Anti-Critic has stated that this treatment is "for better or worse, as close to an official seventh episode as there is likely to ever be." Back from the Dead: Ares in episode 5, Hack in episode 6. Bad Boss: In the documentary about himself, Apollo turned out to be this. By The Power Of Grey Skull: "REV UP!" All of Lupa's attacks, called by her wristgadget, are named after movies she's reviewed. Catch-Phrase: "Let me pitch it to you" and "What do you think?" Cosmic Retcon: Revuer 2's Ultimate Final Attack Mode, Retcon, can wipe out anyone from the face of reality when hit. Crisis Crossover: Obscurus Lupa of Channel Awesome plays a major part (though not as herself), having been friends with Matt before her TGWTG pickup. Several of his XNO co-oworkers have appeared in episodes as well, and he plans to include as many reviewers as he can in the final two episodes. He also did one with EZ Rider, reviewing Shin Kamen Rider: Prologue. Doppelgänger Attack: The Sequel Attack Mode allows a Revuer to copy itself. And the Illegal Copy Attack Mode allows a Revuer to copy other things. Ear Worm: In-universe, the mysterious music in the dreams (in real life being "Kara Remembers" from Battlestar Galactica (2003)). Evil vs. Evil: Diamanda Hagan joins the more heroic reviewers because Cinnera stole her chance to destroy them. After G.E.A.R. rises in power, other reviewers such as Spazz join their cause. Fun with Acronyms: Hack's new series Damn! : Decisively Awesome Movies (that all geek-kind should see right...) Now! Gainax Ending: Due to Burkett being unable to complete the saga, it ends on episode six, with G.E.A.R. killing a majority of the surviving reviewers, and Hack returning to life. Hack then kills Ares and Lupa, and is implied to destroy the current Reviewaverse in order for it to be reborn. Again. Geeky Turn-On: Dakota is noticeably into guys who know their Japanese superheroes. Gosh Darn It to Heck! : Of the "Frak" variety. Guilty Pleasures: In-universe, the film Freejack. History Repeats: The original Nerdaria was destroyed by Hack, who wanted the Reviewaverse to be reborn and produce better quality entertainment. At the end of episode 6, he comes back from the dead and is implied to do the same. How Do I Shot Web? : Lupa manages to get a hold of one of the Revuer units, but transforming is harder than it looks. Meaningful Echo: "A dream to some, a nightmare to others..."
Next Sunday A.D.: To avoid Continuity Snarl, Burkett never established when the events of the Saga take place in the Reviewaverse timeline. However, given that the series was to end with several principal characters Dead for Real , others doing a permanent FaceHeel Turn and numerous key locations destroyed, we can safely assume they occur sometime in the near future. Although technically it would be in the past since it takes place in the former Reviewaverse before the current reborn Reviewaverse. Our Hero Is Dead: Apollo just happens to be on the receiving end of the Retcon UFAM. Power Copying: The Critic Mimic Attack Mode allows a Revuer to assume a form similar to another critic. Shared Universe: Of course he's part of the Reviewaverse, he coined the name! Shout-Out: Kamen Rider and other Toku shows are a major influence on the Saga, both on the costuming and the fighting styles. Take That! : The Critic Mimic Attack Mode could be one towards people who rip off talented critics.